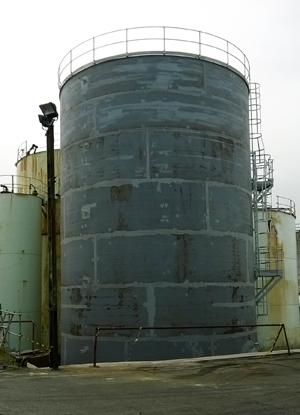 Construction of a huge new storage tank capable of holding 800 cubic metres of Recovered Fuel Oil (RFO) is nearing completion at waste management company Cleansing Service Group’s (CSG) hazardous waste treatment facility at Cadishead, near Manchester. The £150,000 bespoke tank has been manufactured on site, with seven sections being welded together before the 10 metre structure was jacked up into position. Most storage tanks are delivered ‘shop built’ and have a capacity limit of 250m3. This major new storage facility reflects CSG’s growing activity in the oil recovery market. The company has invested heavily in the past few years in acquiring specialist waste oil collection companies, site purchase and new technology designed to gain maximum returns from the treatment of oily liquid waste which can be converted into fuel for use on sites such as power stations and lime kilns. CSG say the new tank, which will boost oil storage capacity at the site to a total of 2,600m3, will allow the company to stockpile supplies of RFO until the current worldwide slump in the price of crude eases. The Cadishead operation currently produces around 1,500m3 of RFO a year from on-site treatments such as gravity separation, centrifuge and heating. A further 1,500m3 of waste engine oil is also stored at the site. As well as Cadishead, CSG operates oil recovery facilities at Bristol, Plymouth, Aylesford, Southampton, Middlesbrough and Coventry, with a new unit opening soon in Worcester. Most of the aqueous waste arriving at these sites is an oily water mixture collected by CSG’s specialist tankers from interceptors, tanks and drainage systems at commercial and industrial facilities such as engineering plants and garage forecourts.